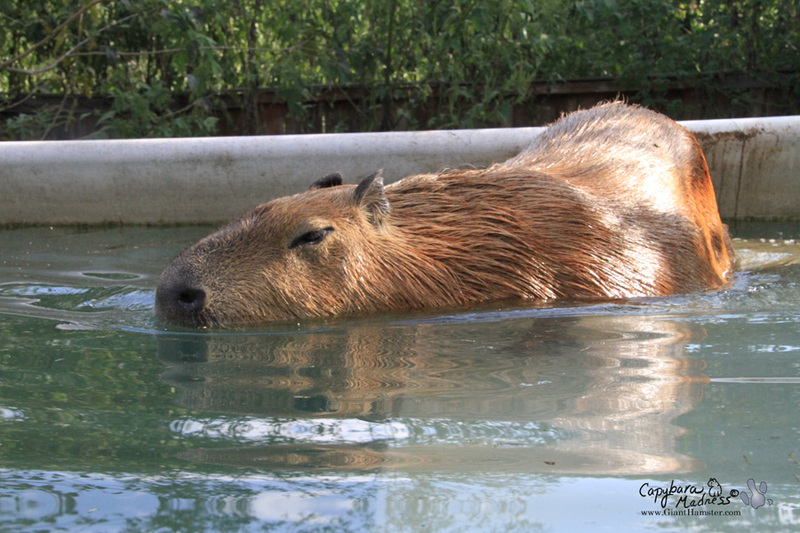 Everyone knows that I, like all capybaras, love the water. 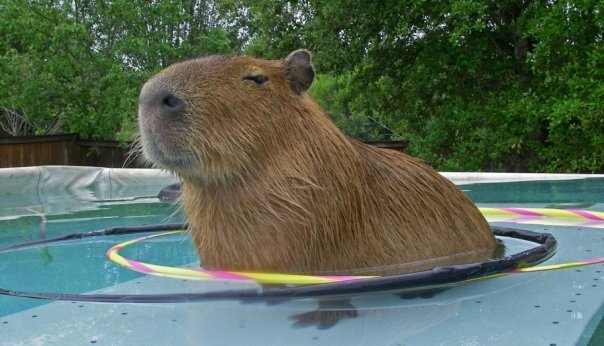 But maybe you didn’t know that I have two pools. I have the little green wading pool that you see in the photo above and I have my big blue pool. I use them both. 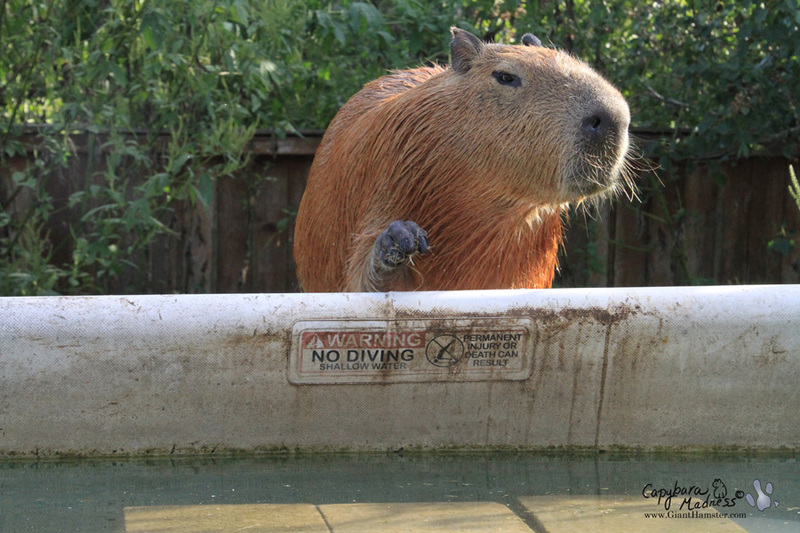 In fact, usually I get in my green pool on my way to my blue pool. 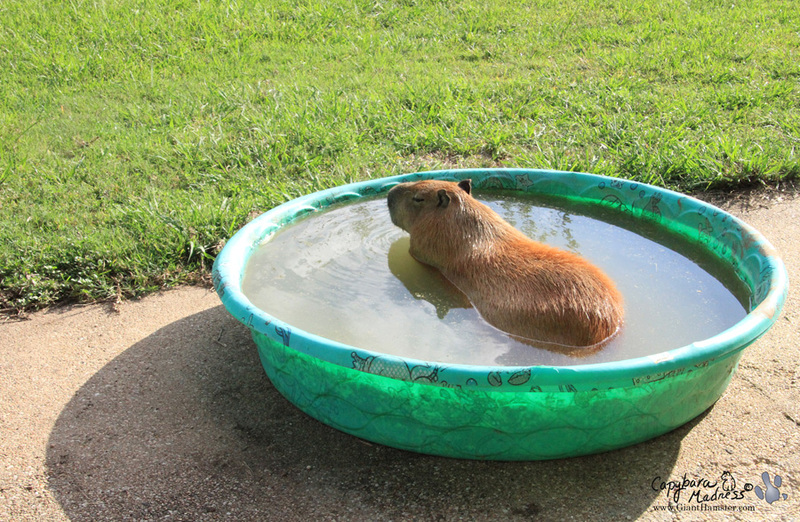 Melly likes it when I do that because, for reasons I do not understand, she likes to keep the big pool clean. 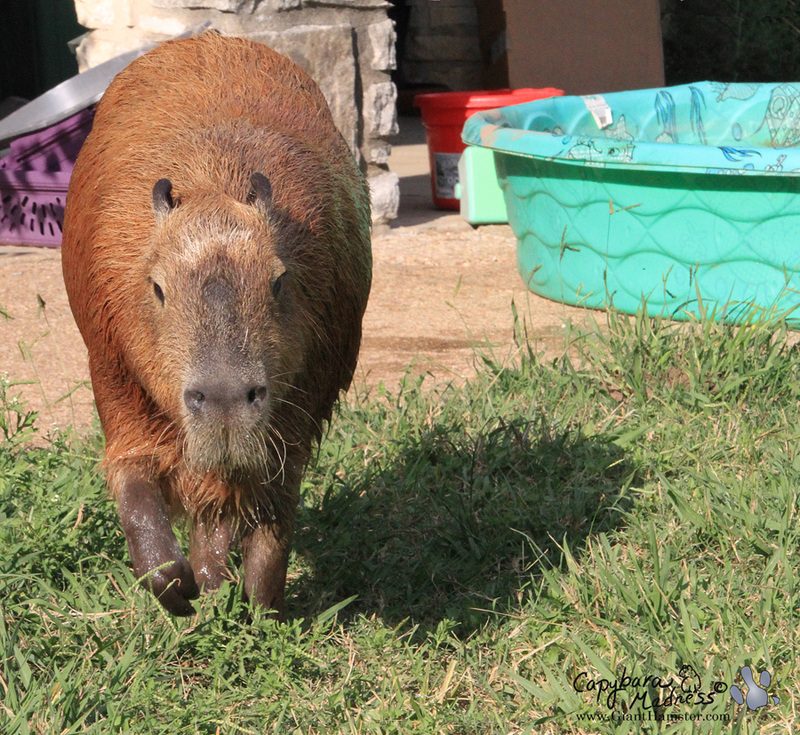 Usually I walk sedately from the green pool to the blue one but occasionally I will run. It kind of depends on how hungry I am. I suppose you might be wondering why hunger would make me want to swim more. Keep reading and I shall explain! 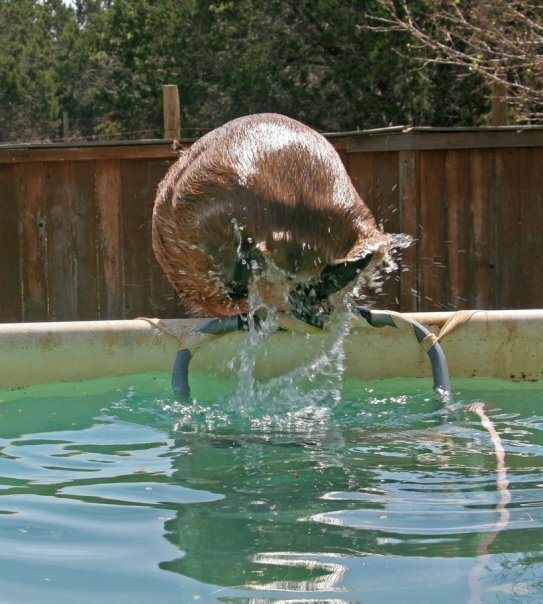 Those are my ears peeking over the edge of the pool! I have a staircase made of hay that I use to get in. In this photo, I am climbing onto the top step and only the top of me is visible. Some people think my ears are my cutest feature. Now I am standing on the top of my hay bale stairs. 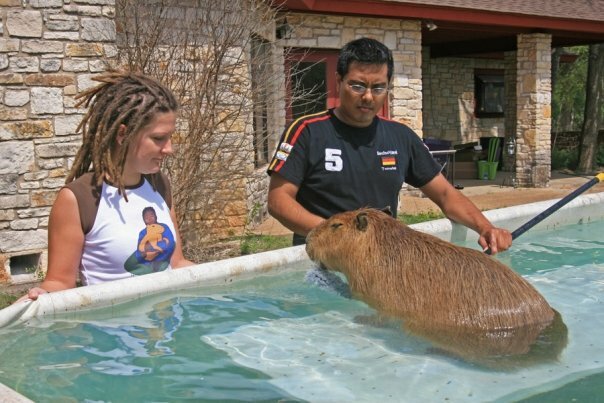 They used to be taller and it was easier to get into my pool. 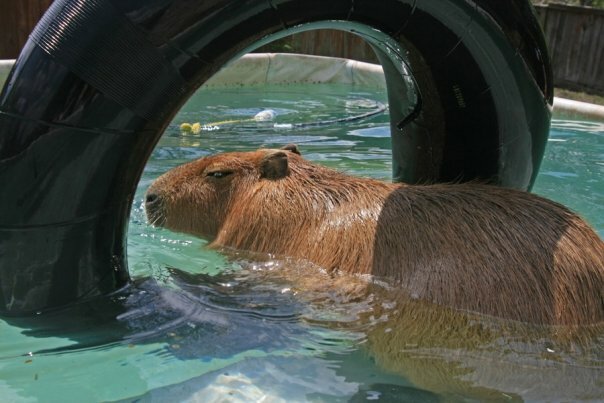 Over time the hay mashes down and it gets harder and harder to get into the pool. You’d think Melly would do something about that but she is either too lazy or too cheap (with the drought, hay has really gone up in price, not that I’m not worth it). Once I get positioned on the top stair, I still have to consider whether I really want to get in or not. Sometimes the water is cold. Or maybe there is an anaconda in there. You can’t be too careful. 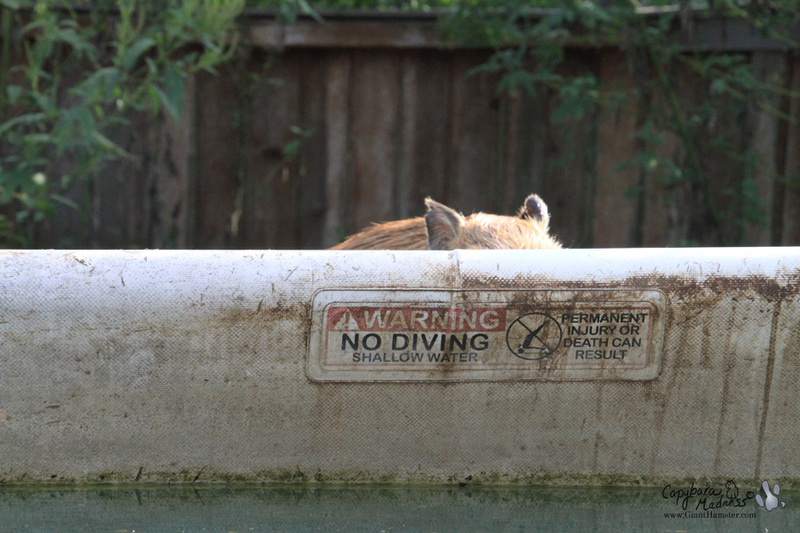 I really could use new hay, it is quite a bit of work for me to get my little paw over the edge of the pool. With all her practice with the camera, you’d think Melly could have caught this incredibly cute moment of mine a little better. As I said earlier, many people consider my ears to be my cutest feature and she completely cut them out of the picture! I’m telling you, if practice makes perfect, Melly should be a lot better at photography than this! Sometimes you have to just jump in with two feet! 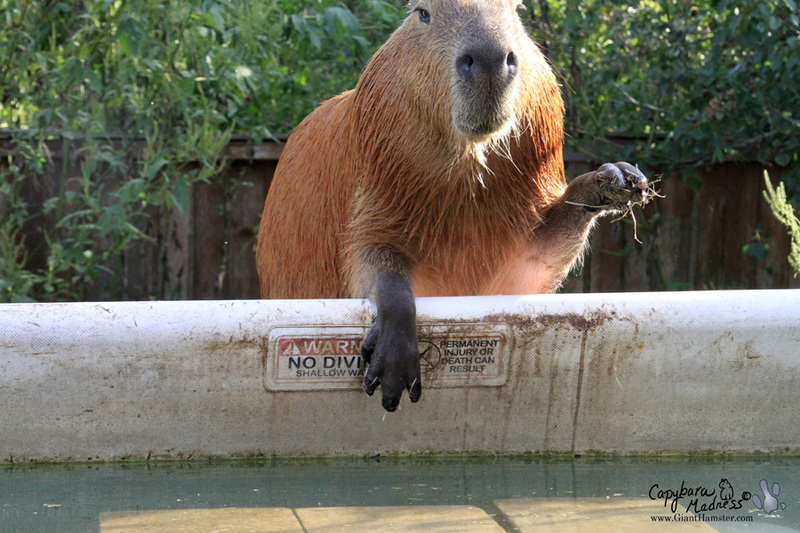 Of course, if you’re a capybara you have four feet and that isn’t so much of a commitment. After all my careful entry, my back feet missed the bricks and I ended up plopping down rather inelegantly. However, I managed not to lose my cute. 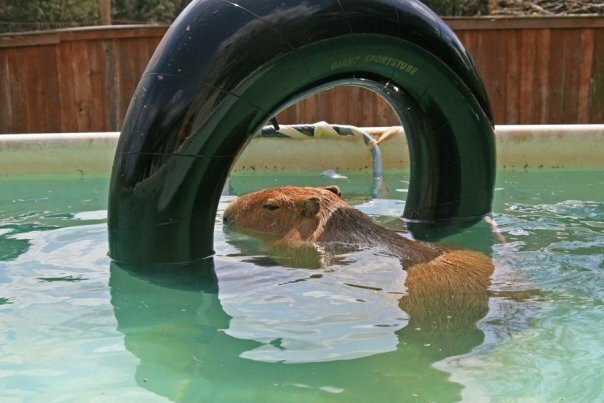 Sometimes I roll over first thing when I get in the pool. I didn’t do that on this day because, as I said, I was hungry. Instead I headed straight into the water for a long swim. 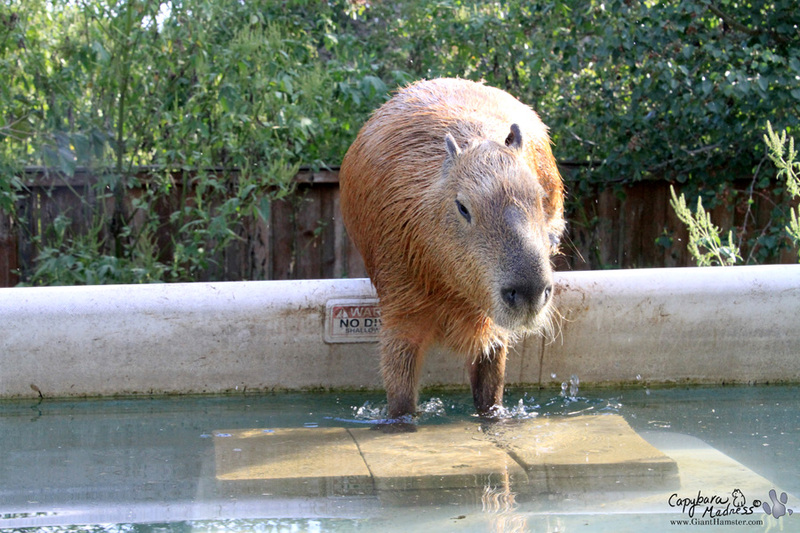 Okay, I admit it, my long swim was only about two feet. I swam straight over to my pool table and sat down, looking out. I wonder why I did that? I told you I was hungry. That pool table is where Melly always feeds me in the afternoon. 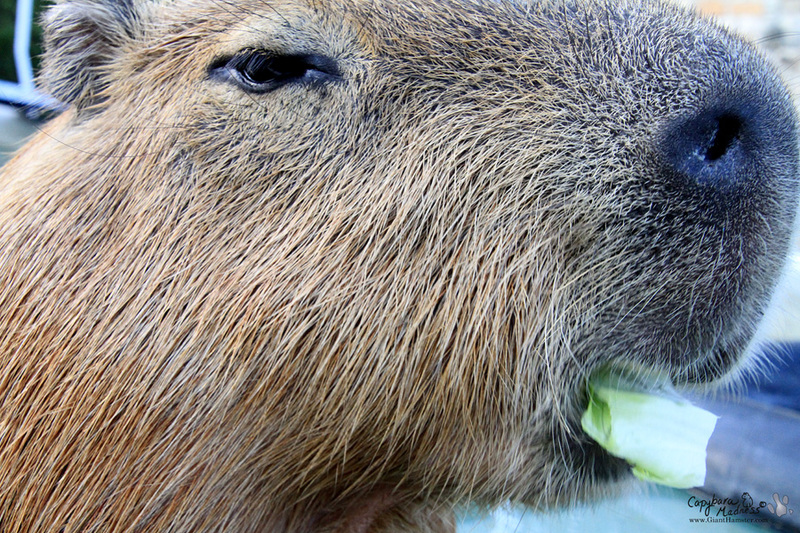 I get one giant head of lettuce and then either some chard or kale or something else tasty. 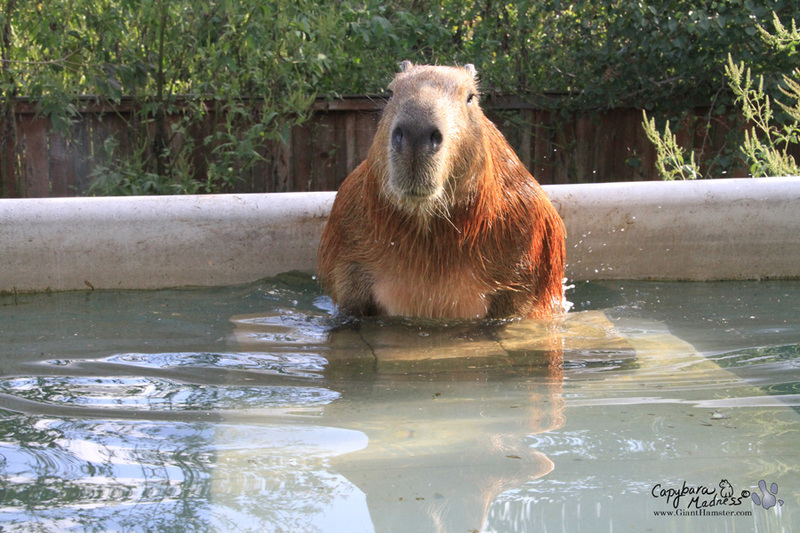 I have heard humans say that you shouldn’t go swimming for 1/2 hour after you eat. 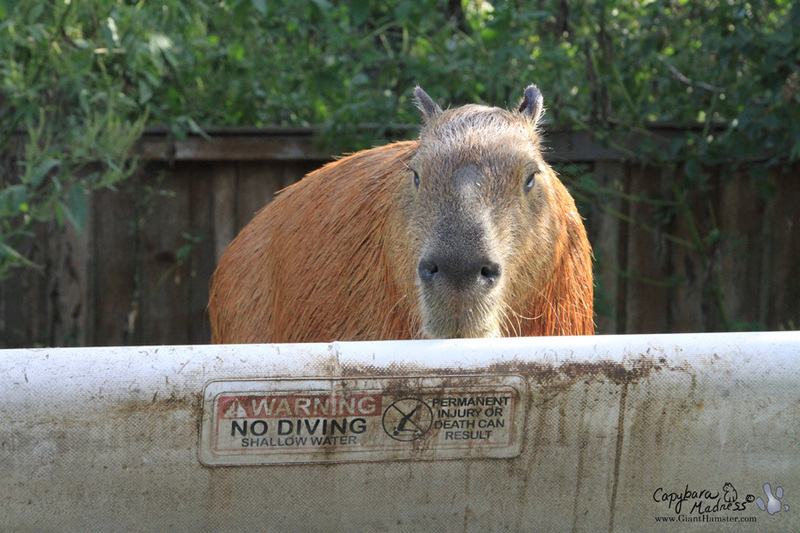 They never say anything about not eating while you are swimming though. 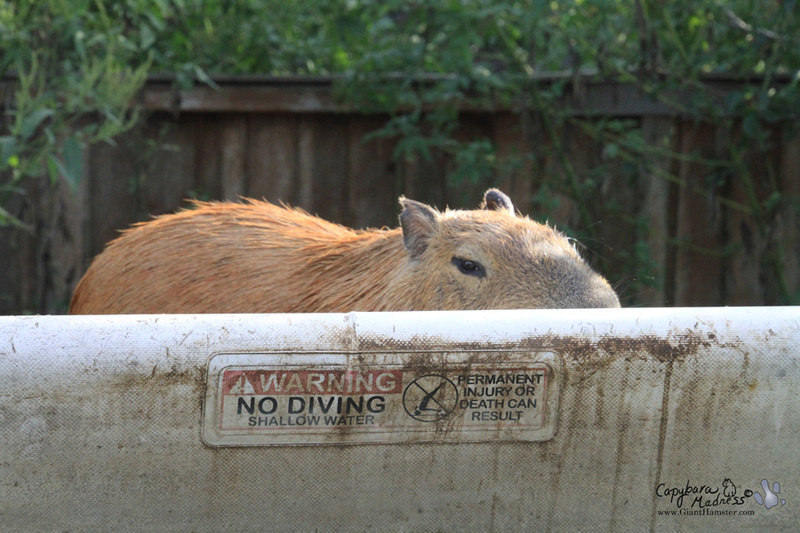 Plus, I’m pretty sure that restriction doesn’t apply to capybaras. Oh Gari, you are so adorable!! 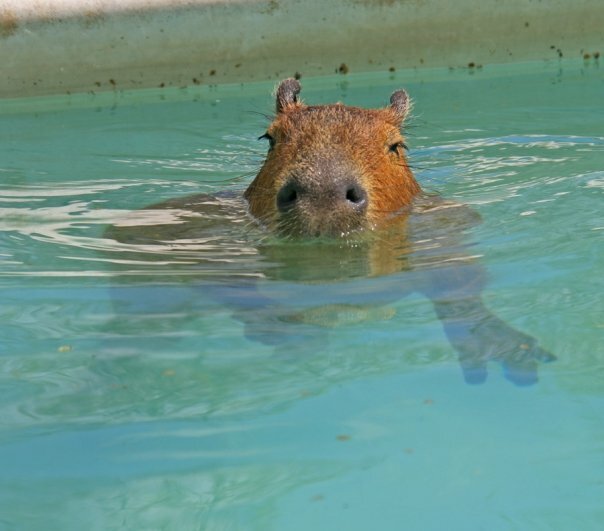 Hoky poky into the pool! Nice pics! 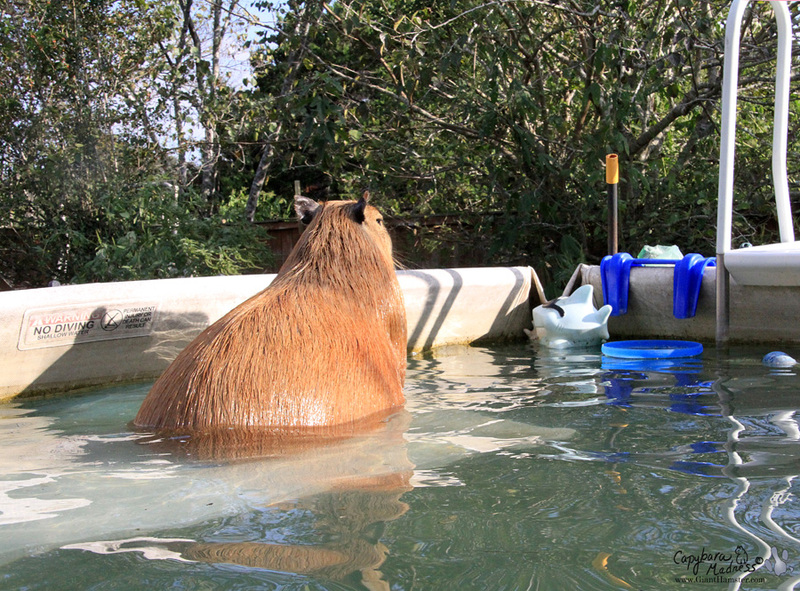 Do love the ears, Gari, but the picture of you sitting in the water is a keeper, too! 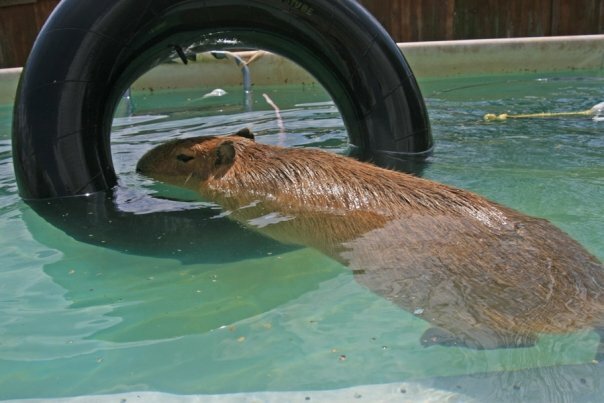 I hope you had a good swim and wallow after you ate! I think your tiny paw is wonderful! 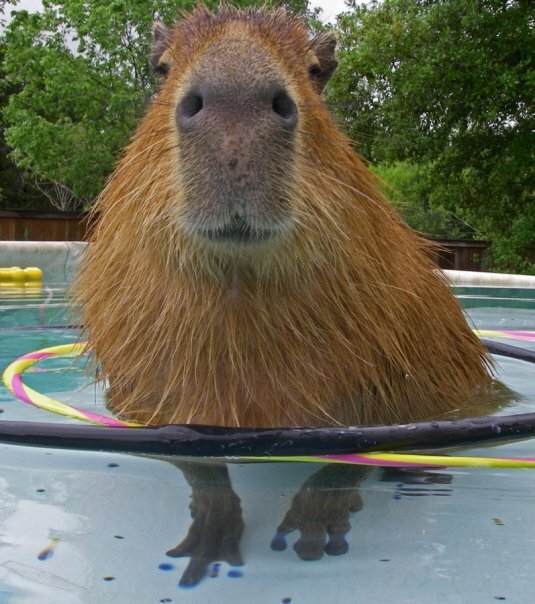 Oh Gari, your pools look so nice in the Texas heat. You are so lucky to have 2 pools. 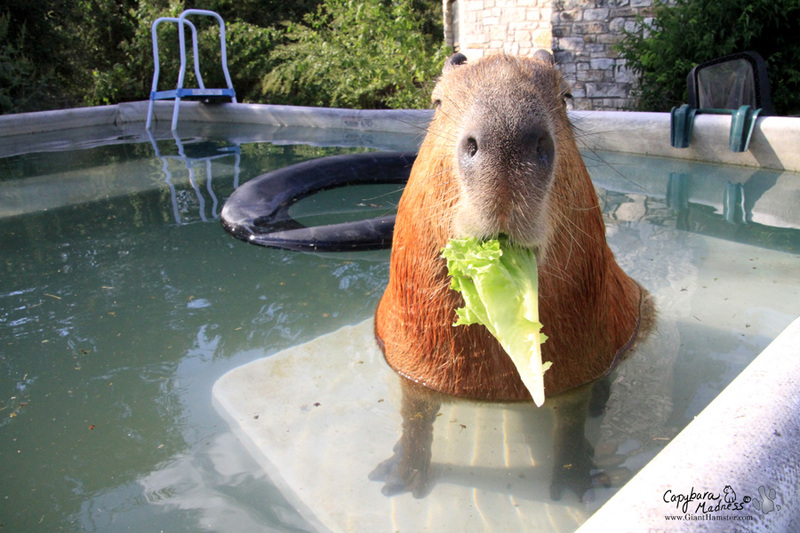 I always thought pictures of you eating were the cutest but eating + swimming is just too much cuteness to handle! Going swimming is more complicated than I thought. But how cool that you have a dining table in the pool. You’re like a movie star! Couldn’t Melly make the pool steps out of something else? Wood or foam or something? That way they wouldn’t get mashed down & would be less expensive. I think my mom took the pic where your ears are missing. My mom always cuts off the top of people’s heads when she takes pictures.